as a mom i couldn't be more proud of my kiddos.......yesterday they ran in the Ladera MS run. Last year Kaylee ran it in 23:00. You have to run it in under 22 minutes to receive a certificate. So that was her goal. I am so proud of her she ran it in 20:38 (according to school, Jeff actually clocked them in 19: 50). she pushed herself so hard that she almost threw up! I love it! this was Andrew's first year to get to run. We asked Poppie to run it with him since mom is out of commission. I told Scott it would be easy, that he would probably walk alot. When Kaylee was a first grader she ran it in like 25 minutes. Well Andrew tried to push his Poppie. He only walked a couple of times and ran it in 22:48. I am so proud. By the time he is a 5th grader none of us will be able to keep up with him. Andrew ran it with his best buddy Gabe. I am proud of all them including Jeff and Scott who had to run hard to keep up with the kids! thanks for doing it. I can't wait to run it next year! 1. He is a great listener, he is my kid who you tell him to do it once and it always gets done. 2. He doesn't usually complain about it either, he just says SURE! 3. He is a great athlete and is very competitive (i have no idea where he gets that from). I love to watch him compete. 4. He is a funny kid and often gets us laughing by the silly things he says. 5. He is a great friend to others, and has many good friends. 6. He is a sensitive soul. (no idea where that comes from either) he even cried in Pete's Dragon. 7. He has beautiful eyes that have that special sparkle in them. I hope you have a great day Bubba, we sure love ya! this year for spring break, we got to ditch the kids in utah with matt and miriam, and head off to vegas. yes people that is right, we had a vacation with no kids! it is the first time we have ever done that. the most we have ever left them is for a night. being pregnant and all i actually cried when we left them. it totally surprised me, cause i was so excited to go. i guess i do love them after all. we started off our trip getting to spend 4 hours in the slc airport. it was a bummer, but we got to watch the byu game and i got in a quick nap. it ended up being a really late night, so the next morning we slept in. 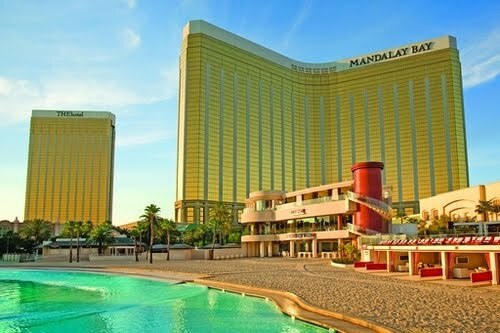 we stayed at the mandalay bay. i usually have a very good sense of direction, but man i kept getting all turned around. the first 3 days i would turn the wrong way getting off the elevator to our room. one of the best days there was spent at the beach at the hotel. it was 78 degrees that day. perfect in my opinion. i can't even remember the last time i was at a pool and wasn't constantly watching and looking for my children. probably 10 years. we had fun in the wave pool, and as we were getting out we heard, "jeff? is that you?" it was crazy running into people we knew, let alone nygrens! that's right it was jeff's uncle steve, barbara, paige, preston, and meschan's family. what are they odds? that night jeff had bought me tickets to the lion king. and let me tell you it was amazing. i loved every minute of it. well maybe not the fact that my water cost $4 and a beer cost $2! other than that it was worth every penny. the costumes are amazing. i had such a great time spending time with jeff, alone. we did find ourselves thinking about the kids ALOT. we kept thinking, "the kids would love this". so we will have to take them there someday.